Your grounds maintenance crews will appreciate how easy is to maintain the grass around this square single pedestal table. 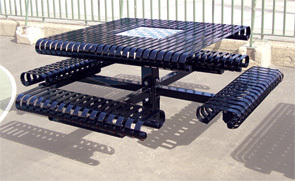 The 47.5" table top is made of 3/16" x 1-1/2" steel slats. The entire table is powder-coated to assure durability and lasting beauty. The optional silkscreened game board is suitable for checkers and chess. This pedestal table is available in the color options as shown. The state of the art finishing process used on the picnic table combines the application of an 'Electrocoat Zinc Rich Primer' with a durable polyester powder-coat top layer to ensure every crevice and joint is completely sealed, providing full protection against	corrosion and weathering. Picnic table are finished in either a gloss or textured polyester powder-coat finish.